Lesson plans, assignments, edTPA, OH MY! I’m about to start full time teaching for six weeks and it feels SO crazy. It seems like just yesterday I was meeting my teacher and getting to know my students for the first time. We are just now reaching our mid-point of the semester. This week I will be filling out midterm reports – I repeat, SO crazy! I feel a bit overwhelmed and I feel a bit intimidated, but I know that these next six weeks will be one of the best experiences I can have as a teacher-in-training. To catch you up on some events that lead up to this point in my semester, I will start by sharing a super-cool science unit we just started in my class! At our school, we alternate our science and social studies units. We just concluded a social studies unit on communities, and last week I kicked off our unit on plants and seeds! Plants and seeds is a unit that is near and dear to my heart. I love doing inquiry-based science lessons, and I have experience doing an inquiry-based unit on plants and seeds! We started off the unit last week talking about plant anatomy. 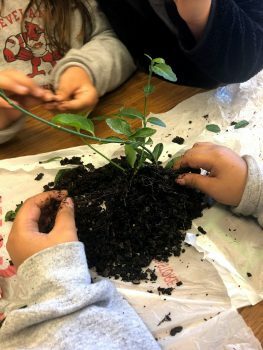 Last Thursday, I brought in real plants for my students to explore. Some of the students in my class had never touched a plant before, so it was exciting to see their reactions to this messy exploration! This experience was extremely beneficial for my students because it helped them to put meaning behind the content that they are learning. I have a few more tricks up my sleeve to carry us through this unit, and I am excited to update you more as the explorations continue! While I have faced multiple challenges during this student teaching experience there is one that stands out more than the rest. This challenge is stress-management. My cooperating teacher and I often talk about how we have “too many tabs” open in our brains at once. Imagine you’re browsing the internet and you keep opening tab after tab after tab. Then, you get so intrigued with one tab you’re looking at, so you pull it into a brand-new window. THEN, you keep opening tab after tab after tab. Soon enough, you have over 20 tabs open in your new window AND you’ve completely forgotten about that other window with your OTHER 20 tabs! THAT’S how my brain feels every day when I’m teaching. We are asked to juggle so many things as teachers: developmentally appropriate assessment, meaningful activities, differentiation… the list goes on and on. I am thankful that I do not have to navigate this stress alone. My cooperating teacher and my supervisor are constantly helping me through the stress of being a new teacher. 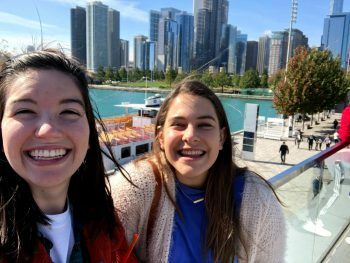 I believe that stress-management will be a challenge I’m continually battling, but I’m thankful that the Chicago Semester has provided me with endless support through this navigation process. Something exciting that happened this weekend is that my dear friend Mariah came to visit me from Calvin! Mariah was one of my residents when I was an RA two years ago. Fast-forward to today and Mariah is an RA herself! As an RA at Calvin, you typically get one weekend off per month. I’m grateful that Mariah took her weekend off to come visit me in the city. Mariah had never been to Chicago (because she is originally from California), so I was able to show her all the iconic Chicago hot-spots. A highlight from our endeavors is that we took public transit to Navy Pier and Millennium Park. It was so fun to walk around and show Mariah bits and pieces of Chicago that I have come to know and love. I’m very thankful to have friends like Mariah who support me in my great adventure student teaching in CPS. While it was sad to see her leave, I am thankful that I have this change to live in a city that I am genuinely excited to show off.